Group succeeds in lighting candles for Hanukkah at the Kotel in defiance of traditional practice. Earlier this week, Israel’s Attorney General’s Office ordered Kotel Chief Rabbi Shmuel Rabinowitz to integrate women in the traditional state Hanukkah candle lighting ceremony. Following those orders 100 women, including several female IDF soldiers, participated in the state candle-lighting ceremony at the Kotel Plaza on Sunday night for the first night of the holiday. In addition, 20 members of the Women of the Wall group were granted permission by security guards to enter with their menorahs, and MK Ksenia Svetlova of the Zionist Union party used her parliamentary immunity to bring a communal menorah in to the women's section of the Kotel Plaza. The main national candle-lighting ceremony was held last night (Sunday) in the men’s section of the Kotel plaza, where the first candle was lit by Prime Minister Binyamin Netanyahu. 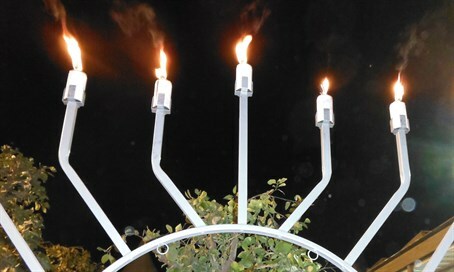 Rabbi Rabinowitz last week opposed the order to integrate women in the state lighting ceremony, arguing that women wishing to perform an alternative non-Orthodox ceremony lighting the Hanukkiya menorah (candelabra) should do so at the Ezrat Yisrael section, which was built in 2013 specifically to cater to Reform and Conservative Jews' demands at the Kotel.